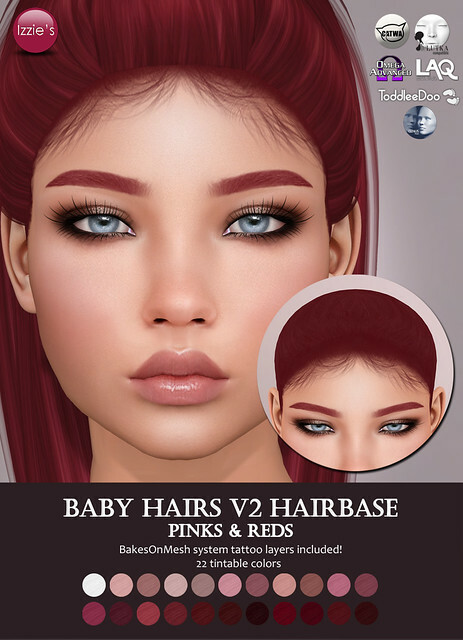 Izzie’s released a pinks & reds edition of the Baby Hairs V2 Hairbase at the mainstore for Fifty Linden Fridays. The set includes appliers for Catwa, LeLutka Bento (tattoo), LAQ/Omega, Genus and ToddleeDoo and comes in 22 tintable colors. BakesOnMesh system tattoo layers are included as well. Please try a free demo before purchasing!